Tai Chi is a gentle form of exercise appropriate for all ages. It promotes benefits such as increased flexibility, strength, balance, and improves concentration. Tai Chi balances the health of mind, body and spirit. The focus of the arts we practice is on maximizing the amazing health benefits, while building a dedicated community of practitioners. Paul Bromley is a registered Occupational Therapist and has over 20 years experience. All classes except the Swimming Dragon class are drop in friendly. For new students the first class is free! ​Wednesday evening yoga is a gentle flow yoga class, suitable for all levels of practitioner. 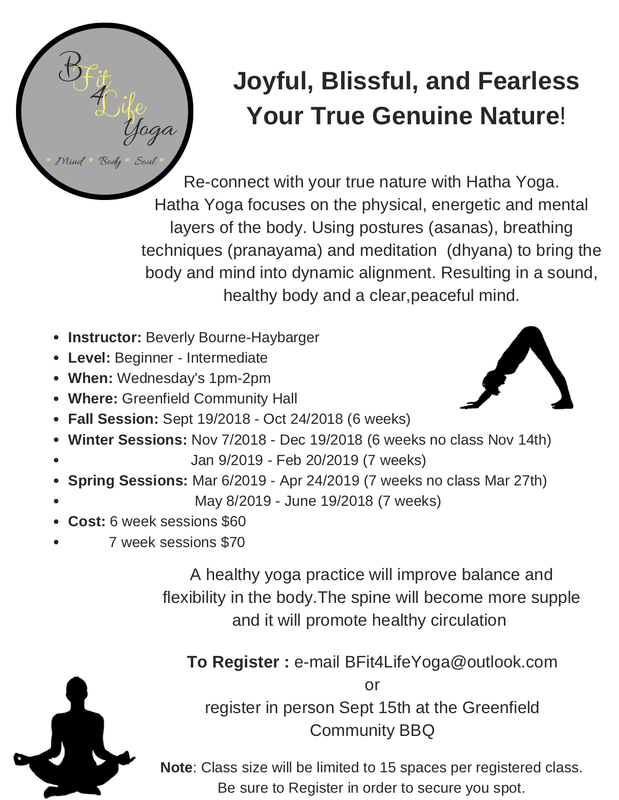 In this class, we will work with the physical body, doing postures to open, strengthen, and balance the body, then will connect this movement with the breath. The posture sequence will differ slightly each week, but each sequence will leave you feeling balanced, strong, and calm. ​Joyful, Blissful, and Fearless. Your True Genuine Nature! A Community Garden is coming to Greenfield in 2018! We have formed a Greenfield Community Garden committee and are always looking for more members! It is a low time commitment but immensely rewarding committee to join. If you don't want to commit to this group then you can certainly just email our President and Garden Lead, Sam Goertz at president@greenfieldcommunityleague.com. He will be happy to answer any questions or simply just reserve your plot for you. The Garden Committee is currently in the process of applying for a Community Garden Grant from Sustainable Food Edmonton which will provide funding for its creation. The Committee is also currently working on its bylaws and individual gardener contracts. Next meeting TBA.